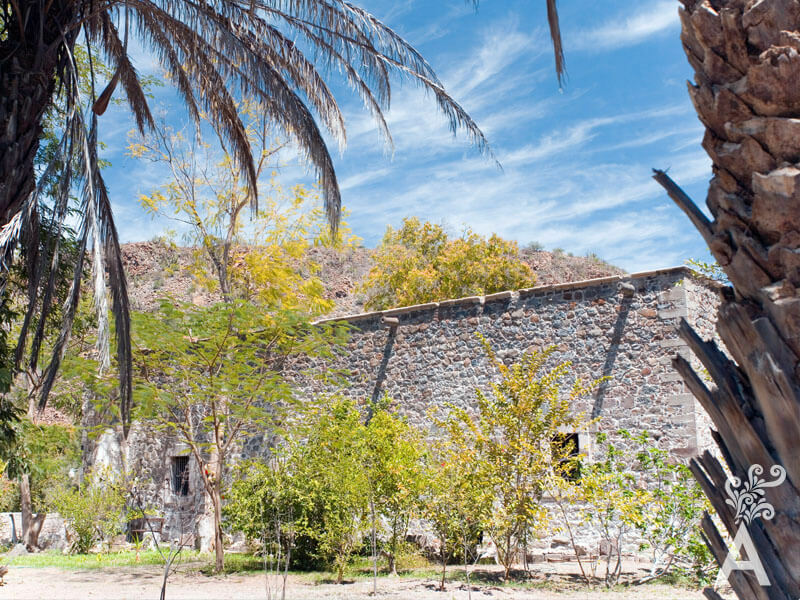 The San Jose de Comondu Mission is located about 30 miles west of the town of Loreto. The area was first explored in December 1684 by Admiral Isidro de Atondo y Antillon and Father Eusebio Francisco Kino. It was visited again during the summer of 1708 by the Fathers Juan Maria Salvatierra, Juan de Ugarte and Julian Mayorga. 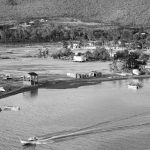 The mission was endowed by Don Jose de la Peña Castrejon y Salzines, Marquis of Villapuente and founded in that year by Father Mayorga who remained there as the resident minister until his death in November 1736. Due to the shortage of water, the mission joined the Vista of San Miguel de Comondu, established by Father Juan de Ugarte, in 1714. 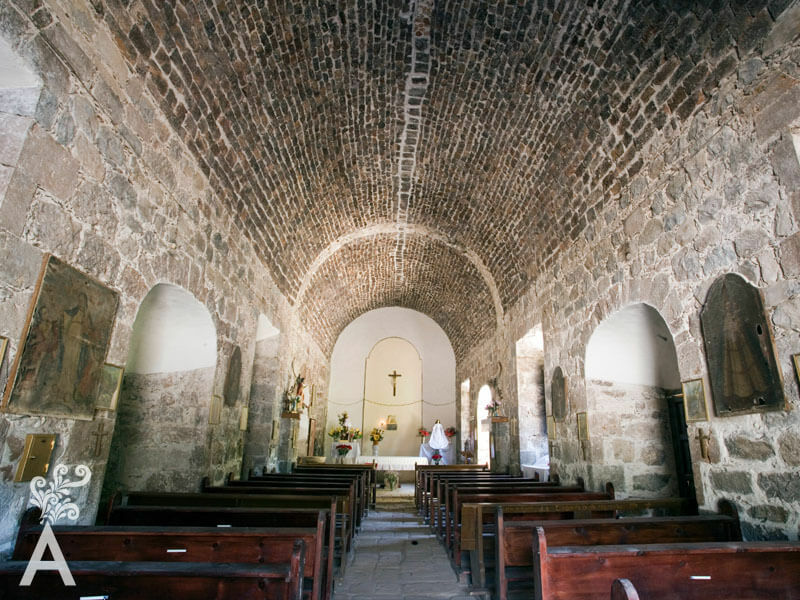 The stone church was built in 1750 by Father Franz Inama. Through the study of missionary architecture, masterfully assembeled by Salvador Hinojosa, not only is the mission recreated, so are the very ideas of those who conceived and then constructed the buildings. The analysis of the architectural elements that compose the structure offers a way of rational and emotional understanding of the physical lifting, location plans, vegetation, façade details and unique sections of the work as a whole. 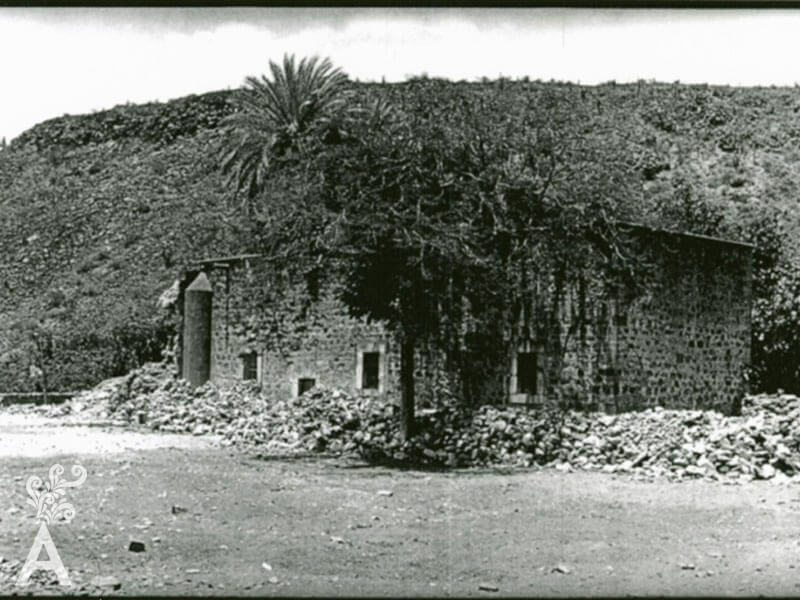 The result is a valuable contribution to the San Jose de Comondu Mission studies. The eternally beautiful outer enclosure was carved and sculpted from pink stone and the altarpieces engraved with gold according to the religious practices of the time. The unique style could be called austere Baroque renaissance. The tabernacles, altars, chapels, interior rooms, and outdoor wings created a whole that is integrated into the natural environment, displaying the artistic abilities of the missionaries and the indigenous hands that were involved. 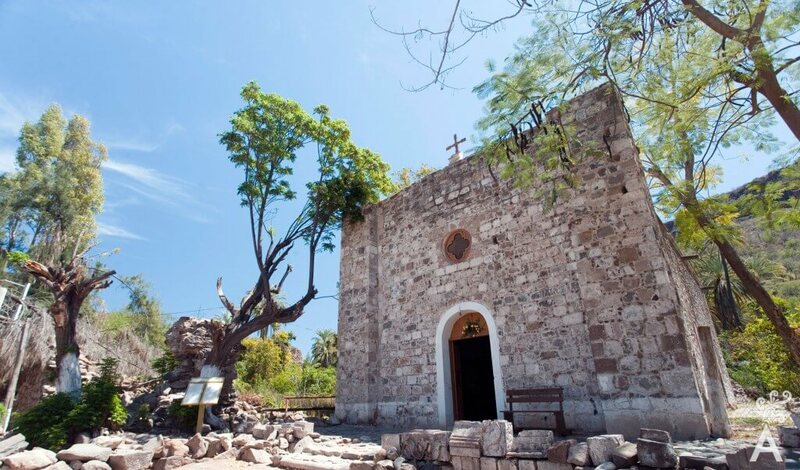 The building maintains a deeply religious message in its symbols and sumptuously decorated art that is an essential part of the Baja California Sur identity. The architectural design of the Basilica style church features a large rectangular nave composed of one or more rooms, always in odd numbers. There are three doors and near them, on the inner side, three holy water baptismal fonts. The floor is paved with hewn stone, there is a presbytery with a wooden trellis and a choir balcony in which there is an old monochord and a bassoon. Inside, there are three altars. On the largest, is a gold chalice with an image of San Jose and the baby Jesus, a tiara and a branch with flowers, both of silver. Another altar contains a large image of San Miguel and seven linen canvases with various prayers. This altar has a lectern of gold and three corners to symbolize the Holy Trinity. On the altar, next to the chapel, is an image of Jesus with San Jose and San Juan Nepomuceno, a curtain of fine silk with a large image of Father San Francisco and another small image of San Ignacio. In a niche next to the Gospel is the image of San Miguel, an old silk curtain and four images with several prayers. Confessionals with leather chairs are also in this area. On the walls, hang nine paintings with the stages of the life of Saint Joseph, as well as three other paintings. There is also a room with a beautiful stone baptismal font and images of San Juan Bautista and San Jose. The structure does not have a formal tower. Six medium and small bells are hung in a stick framework. An historical description states that 126 books formed the library. A vaulted sacristy provides a description of the various tools, images and clothing for religious services. In addition, there is a vault, a room for the Fathers and thatched huts for offices. 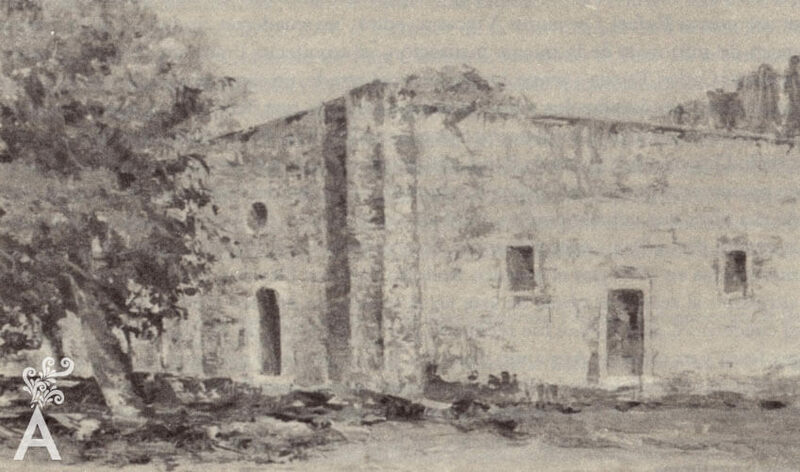 In 1827, the mission was abandoned. In the early next century, the structures were adapted for other uses, leaving only the nave. In 1972 and 1973, the National Institute of Anthropology and History began restoration work, especially on the vaulted roof and stone details in the masonry walls. In 1991, the Ministry of Urban Development completed small but very important restorations in large cracks in the main body of the nave. Within the current nave, there are two rectangular oil paintings finished off in a half circle. One represents San Jose and the other Our Lady of Loreto. It is worth noting that these works were cataloged by Dr. Barbara Meyer de Stinglhamber in her book SACRED ART IN BAJA CALIFORNIA SUR XVII-XIX CENTURIES. The library contained in this place of worship was one of the most comprehensive in its day. There were 153 volumes at the time the Franciscans settled in the area in 1773, as stated in the inventories provided by Lic. Sergio Avila and Lic. Moses Eligio Coronado. Through the collection of these bibliographic jewels, the Jesuits had the opportunity to spiritually enrich themselves by reading a copy of the utmost moral theology. In fact, by 1695, three volumes of these works had already been published. The author was the Spanish Capuchin Jaime Corella (1657-1699), a renowned theologian and preacher. According to documents of the time, the purpose for purchasing the decorations with large amounts of money was to instill the respect it was due, and at the same time, provide prestige to Catholic worship in Baja California Sur. The altarpiece was a means of expression whose primary purpose was to serve as a didactic-religious element. In it, a story is told that when beheld, is learned.